Buenos dias. Peru is considered one of the world’s great centers of civilization. Long before Francisco Pizarro and his conquistadors invaded the country, there was life. In fact, Peru’s history spans over thousands of years and the multi-ethnic people of Peru today are the result of the native Andeans, Spaniards (many of whom were Sephardic and Muslim), Chinese, Japanese and West African slaves who were brought over by the Spaniards. Their cuisines melded with the tropical natural resources found in the region, from Pacific Coast fish to the vegetables grown in the temperate climate of The Andes…and fusion cooking was born. It’s now been taken to the nth degree in the cities. According to a recent article in Bon Appétit magazine, Lima is “The Next Great Food City“. Personally, Peru is high on my wishlist of travel destinations. There’s the cultural mix that always fascinates, the lure of Machu Picchu, and now to know it’s considered “The Next Great Food City” just makes this food blogger’s heart race! This is one of the tour meals that I’d been really looking forward to and I was fortunate to have one of my long-time foodie friends in town to share the experience. Back in the day, as they say, Norma and I catered a few parties together in NY and, besides remaining good friends, we’ve been each other’s culinary sounding board over 2 decades. Our conversations and e-mails are peppered (pun intended) with foodchat. Knowing that we were going to prepare a Peruvian dinner, Norma and her husband arrived from NY with 2 jars of Aji Amarillo (paste and whole) as well as 2 delicacies she picked up for me from the Greek markets in Astoria (slated for a different post.) These peppers are the main heat in Peruvian dishes and are the equivalent of jalapeno. Mucho caliente. I put a wee bit of the paste in the potato dish which we think helped add to the color. We had a good ‘hang out’ time eating, drinking, playing canasta, and cooking our delicious Peruvian dinner. 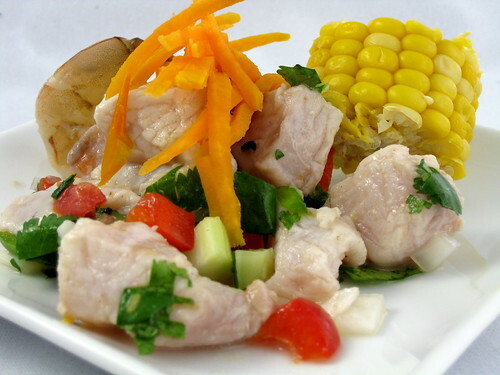 Peruvian Ceviche is served with a round of corn and sweet potatoes which I chose to shred on top. As suggested, I used mahi-mahi but couldn’t help sneaking in a couple of shrimp. As I said to my friends, I don’t know why I don’t eat this every day. It’s so good. 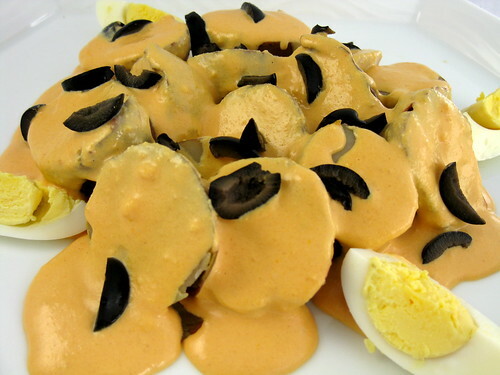 Papas a la Huancaina is another typical dish from Peru. It has a deep history dating back to the Incas and the 12 or 13th century when crops were planted on steps that went down the Andes Mountains. This allowed rain to to be carried down steep mountains to every crop. Peru boasts over 200 varieties of potatoes today. Since I had to buy corn for the ceviche, I decided to roast a few ears to serve as a side. In keeping with the flavors of the other dishes, these were drizzled with olive oil, lime juice and zest, S&P and roasted in a high heat oven. And, ladies and gents, the star of the evening…Peruvian Chicken. If you are going to take one recipe to try from this tour, I encourage you to try this. I certainly will do it again…and again. Note: Sadly, the majority of the population lives in extreme poverty. Health and education are sub-par and although Peru has been around for thousands of years, it is considered a ‘developing country’. Further information can be found at The World Food Programme, the organization through which BloggerAid chose to channel its efforts. Friends of the World Food Programme recently blogged about their time in Peru and reported on their initiative to help build a water lagoon reservoir on a work-for-food project with the people. Visit their blog for more information and beautiful photos. We end this tour in the U.S.A. (the ‘you all‘ south part) on or about April 6. Yes, all good things must come to an end. Coincidentally, as I post this, I’m leaving home for the Metropolitan Food & Entertaining Show being held in Palm Beach today. Paula Dean (while not my FoodTV favorite) is one of the featured presenters so I’m going to stop by and see if I can warm up to her style of cooking for my post next week. Y’all come back, you hear? The Penultimate* Round-Up will be posted on April 8. *I was taught never to say ‘ultimate’. I love that shot of the corn, fabulous! Everything sounds delicious. Have fun at the Food & Entertaining Show. Lovely, Joan, …I could say I had dinner watching your dishes! Do you really play canasta?? ?…I am a big fan of it!..and quite all card games…except bridge! See you in a few days, I don’t know yet which peruvian dish I will offer my guys! dear joan…go and enjoy…we’ll wait for you here. Great post with beautiful photos! I’m going to take a peek at that chicken recipe! Thanks for the culinary info on Peru! Everything sounds wonderful here! Enjoy the show and I can’t wait to hear about it! All these pictures look wonderful to me I can nearly smell it from here ;D.
That corn is jumping out of my screen!!! 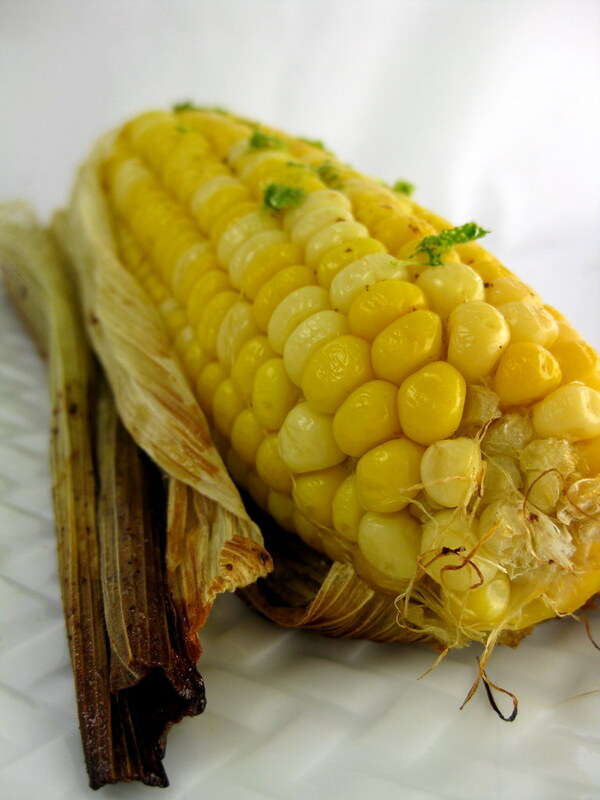 I did know about ceviche in Peruvian cuisine, the corn is obvious, the chicken – delish! It’s an old nation (natives) and rightfully a rich one. Cuisines like this deserve more attention. Lovely spread as always. Hey, I was gonna make that Potato dish, but now I think I’ll go play with some quinoa. See you in Macchu Picchu! On a mission to try that chicken. Once again awesome job always love reading your blog. The chicken looks fantastic and so does the corn. I have your Peruvian dessert on my blog right now!… ALFAJORES! My good friend and neighbor is from Peru & she is always talking about the great food of her country. Nice job w/ your menu! Joan have fun at the show. I went a few years ago up here in DC and saw Paula and she is a hoot in real life. Quite the entertainer even with all that butter. 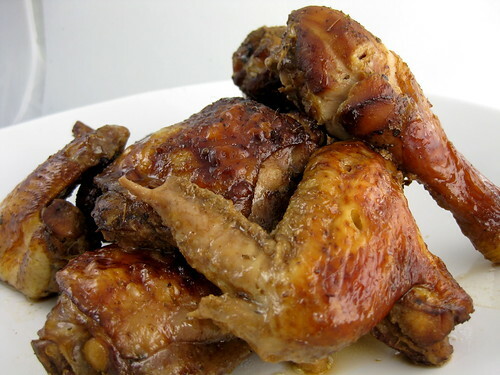 The Chicken looks great and will have to try it out soon. that chicken looks fab! and my fave photo is of the corn. !muy interesante! I adore Peruvian cooking. I spent some time in Lima and was totally impressed by the cuisine. Your meal looks fabulous. 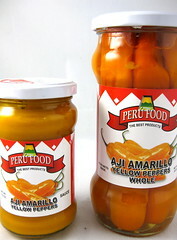 My favorite pepper of all time is the aji amarillo.